A huge thank you to Caroline of Portrait of A Woman, for sending this book for me to read. This review was originally posted on Caroline's blog for her HIV/Aids in Teen Lit event back in December. 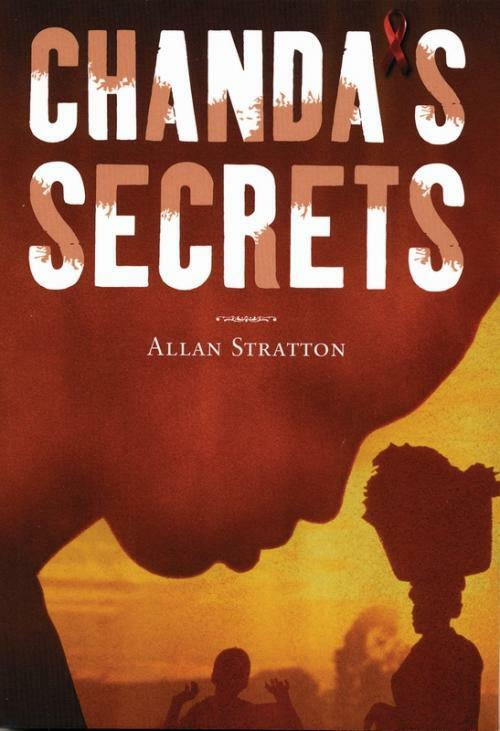 Chanda's Secrets was the only YA book I knew of before her event that dealt with HIV/AIDS and I'm so glad to have read it. I knew beforehand that this book would be difficult to read, and it was. But it also highlighted a lot of the issues surrounding HIV and AIDS. Chanda is a bright 16 year old girl living in (a fictional sub-Saharan country in) Africa - she hopes to do well in school and maybe get a scholarship and make something of her life. As the novel opens, she's on her way to make the arrangements for her little sister's funeral and burial. At just 18 months, Sara didn't have much of a life. Crying constantly and always poorly, Chanda feels guilty for all those horrible things that she used to think about her little sister. But Chanda soon realises that it wasn't bad thoughts that caused Sara's death but something much bigger and more dangerous. And it won't stop with just poor Sara. Chanda is an amazing character, smart and observant and really brave. She has to grow up very quickly dealing with Sara's death and her mother depends on her a great deal to keep the family together and to get what needs to be done. Sara's death affects everyone. Sara's mother is depressed and doesn't want to get out of bed, Sara's father goes off on drunken benders. Chanda's little sister, Iris, believes Sara is her imaginary friend and stops listening to Chanda or her mother, skipping school and playing in dangerous places. All around her, Chanda witnesses the effects of AIDS on her community and the shame that it is wrapped up in. It is never spoken of however, but covered up in so many ways. Causes of death are lied about and hidden and the nearby AIDS clinic is avoided at all costs. Nobody wants to own up to having AIDS or having a loved one with AIDS, believing it a curse of God. Everyone keeps their family's secrets. When Chanda's mother continues to worsen, Chanda must keep another secret. She must face the reality that her mother might die of AIDS as well. Alongside Chanda's ongoing problems with her family, times are also tough for Chanda's best friend, Esther. After her parents died (of AIDS), Esther and her younger brothers and sisters are separated from each other and in order to save up money to bring her family back together, Esther turns to prostitution. Beaten and cast out of her aunt's house for shaming the family, Esther has no where to go and no one to turn to other than Chanda. I thought the friendship between Chanda and Esther was really sweet. And it's mirrored with Mama's friendship with her neighbour, Mrs Tafa. Mrs Tafa seems quite outspoken and controlling and a busybody, but she's still always there for Chanda's family. It's an absolutely heartbreaking book, this one. Reading of the make-shift coffins especially for children at the funeral home. You'll be angry at the doctor who claims multiple medical diplomas and that his medicines will cure even AIDS and taking advantage of his ignorant and illiterate patients. There's previous little running water and lots of work involved in order to get water for cooking and cleaning. Through poverty and general hard times, Chanda's mother has had several different relationships borne of a need to provide for her family, some of which left permanent scars. This was a very complex novel which touches on some really huge concerns facing the epidemic of AIDS in Africa. The lack of accurate information of it's treatment and prevention coupled with the traditional beliefs of spirit doctors and a lack of trust towards medical doctors. The shame and prejudices that surround the disease which prevent people from stepping forward and seeking help. The levels of poverty which mean that paying for legitimate medicines is out of the question. But it's still also the story of Chanda and her family, and most readers will be able to connect in a very personal and emotional way to the journey of Chanda through this difficult time. Chanda's Secrets is about family and friendship. It's about shame and having the courage to stand up and against the stigma of such an evasive issue facing Africa. This sounds like such an interesting read, it sounds like it deals with such a difficult topic very well. Jenni - It is a really interesting read and I really agree that it does discuss a difficult topic incredibly well! I'm so glad I was able to read it.